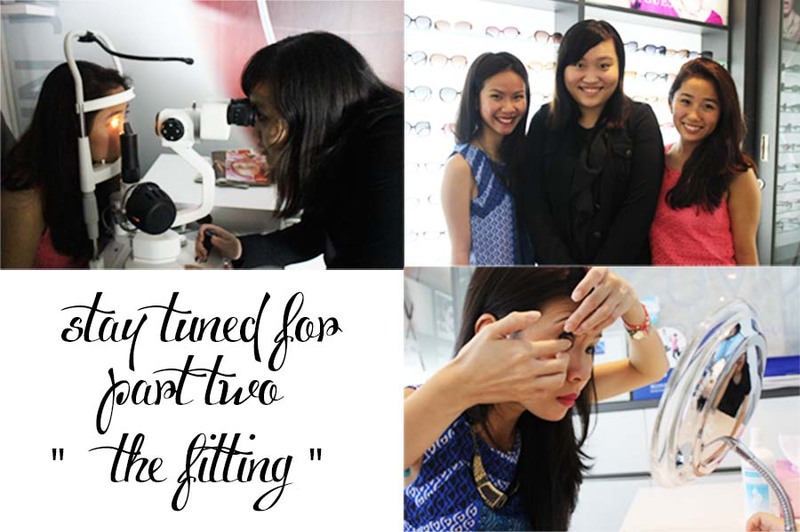 A couple weeks back Sam & I was contacted for a trial of the beauty enhancement 1-day Acuvue define Contact lenses. We were so thrilled to have this opportunity and after setting the date, we went for our eye fitting just last week!
" Whether large or small, the eyes are always alluring and I find myself constantly drawn to people with expressive eyes. I hope my eyes convey strength, confidence and inner beauty. I also hope that that they can serve to inspire and encourage positive energy in others. 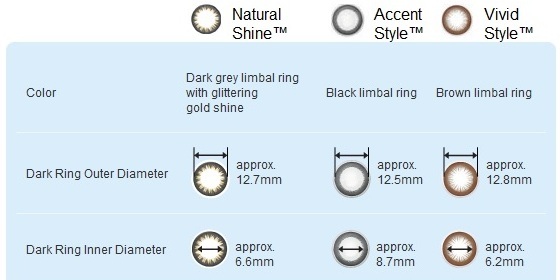 All three variants of 1 • DAY ACUVUE® DEFINETM have their own appeal but my personal favourite is the Accent Style. 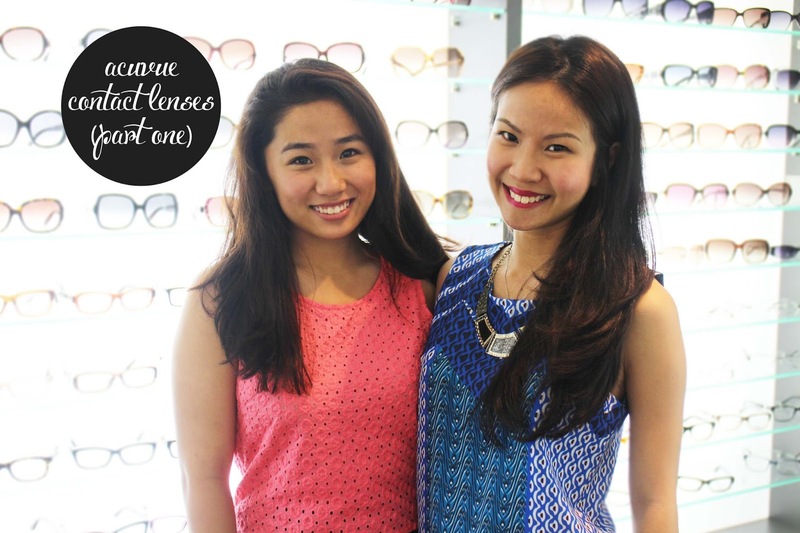 It allows my eyes to look clear and sparkling, and I feel more confident when I put them on. " 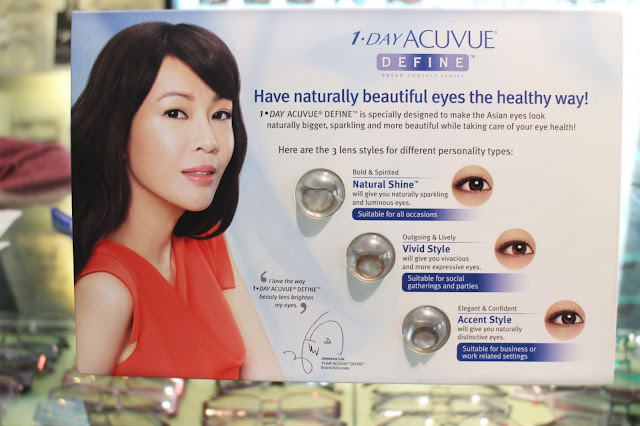 1 • DAY ACUVUE® DEFINE™ beauty contact lenses enhances Asian eyes to look naturally bigger, sparkling and more beautiful – without compromising eye health.Specially designed to enlarge the Asian iris, which averages at 11.4mm in diameter, 1 • DAY ACUVUE® DEFINE™ contact lenses have a natural effect that makes the eyes appear larger and more defined – captivating onlookers and allowing inner beauty to shine. Besides making the eyes beautiful, 1 • DAY ACUVUE® DEFINE™ allows the eyes to stay healthy with its innovative ACUVUE® Triple Care technology – Moisture, Oxygen, UV protection – keeping the eyes comfortable and healthy all day, every day. 1 DAY ACUVUE® DEFINE contains 58% moisture content to give you moist and comfortable eyes all day. 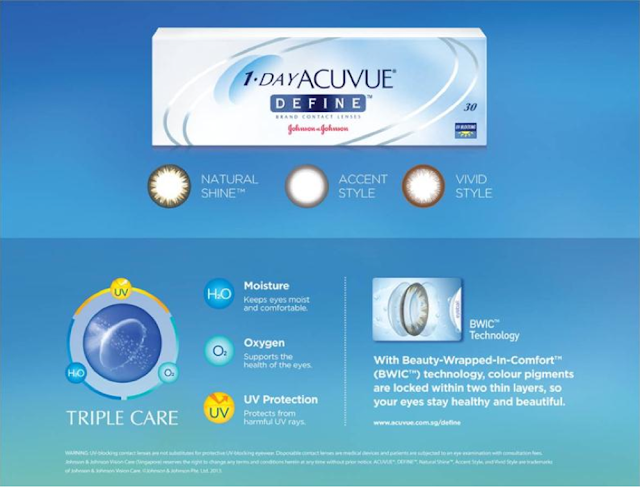 1 • DAY ACUVUE® DEFINE gives wearers the same level of oxygen permeability throughout the lens as clear spherical contact lenses of the same material. 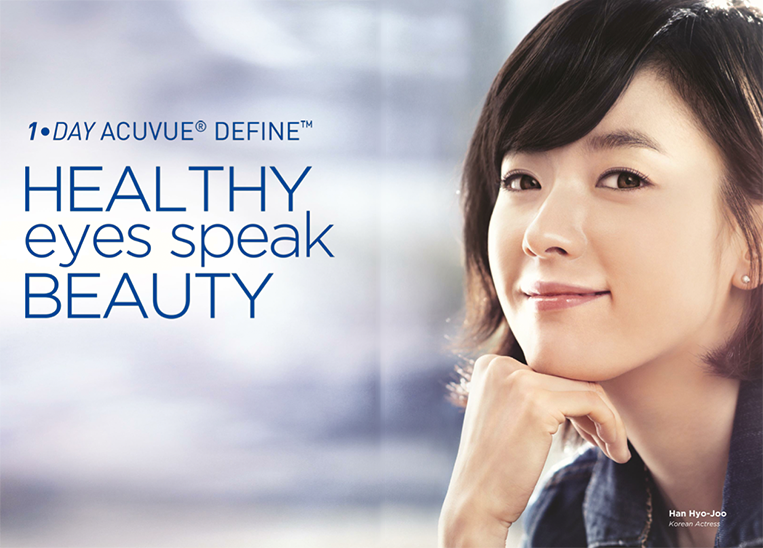 1 • DAY ACUVUE® DEFINE protects your eyes from harmful UV rays by blocking 82% of UV-A and 97% of UV-B radiation. This is in line with internationally recognized Class 2 UV blocking standards. 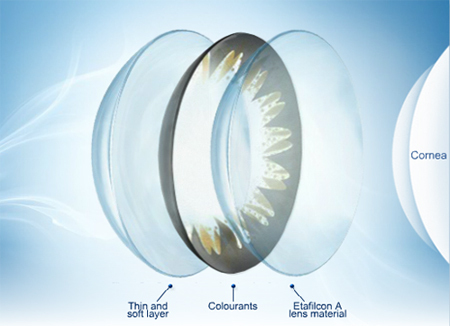 In addition to the Triple Care features, the Beauty-Wrapped-In-Comfort™ technology seals the colorants within the lens so the colorants have no direct contact with the eyes, protecting the health of the eyes. The diagram above shows the protective layers within the contacts to seal the colorant, so for first time colour contact users out there, this might be the option for you! I personally am not someone who wears contacts very often but after reading about the safety measures put to these contacts I do feel a lot safer trying them out. I also have friends who are currently using Acuvue contact lenses on a day to day basis and find them rather hydrating but of course, we will definitely put it to the test and let you all know what we think of them a couple weeks time! There are three different types of contacts from the 1 • DAY ACUVUE® DEFINE line, Natural Shine, Vivid Style and Accent Style. The basic details are given above, should you be looking for the lens that enlarges your pupil the accent style is the option for you! We were given the chance to select the lenses that we'd like to try out, Sam selected the Natural Shine but they did not have stock and hence for the fitting she went with the Accent style lenses. I on the other hand, went for the vivd style lenses which deemed more obvious change in colour for my pupils. I am going to keep this post very short with details of the contact lenses, should you want to read about our experience whilst at the lens fitting, do stayed tuned for it within the week! Have you tried any of Acuvue's contact lenses? Share your experience with us in the comments section ! Hey Kelly! You should! As a first time user, I found it very comfortable! And yes the accent is beautiful! Great review! You look so awesome in these lenses. We sell acuvue defines for very cheap on ContactsCow.com - worldwide shipping.